I heard an interesting thing the other day on a podcast (which one it was escapes me now) about how different our perceptions of games are in a span of only twenty years. The distilled point they were making was that, when we were younger, we would believe that a game was exceptionally difficult when it was probably just poorly designed. As someone who takes time weekly to re-evaluate games for which my opinion of are based mostly on distant memories, it resonated with me and I've been turning it over in my head ever since. 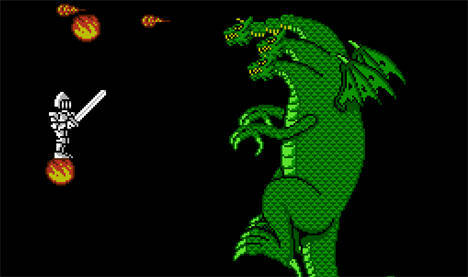 One of the best examples of a game where the "difficulty" was directly proportional to the design choices is the Wizards and Warriors series on the NES. I remember very little about the first two, except that your sword was utterly useless, falling great distances and having to climb back up them was par for the course and that famed romance novel cover model, Fabio, appeared on the box art for the second title, Ironsword. 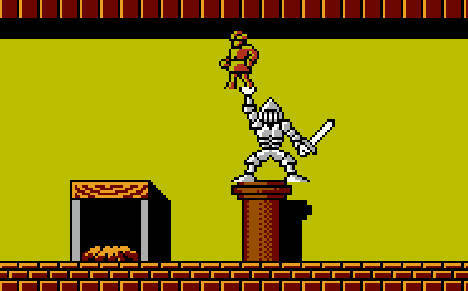 Wizards and Warriors III: Visions of Power, however, became something of a quest for me. I was able to rent it once and became instantly enchanted. Unlike the other titles, this had a level of depth that I never expected. Once the game was returned to the rental shop, however, I wouldn't see it again for over ten years in any form. Trips to used game shops yielded nothing and, if I had downloaded a ROM (which I would not have because that is an evil and wrong thing to do), I would have discovered that every copy I could have found was a bad dump and would not function in any emulator. I found the game about three years ago in a shop. Its label was torn, but this was unmistakeably the object of my desires. I bought said cartridge instantly and, quest completed, did the obvious: I put it on a shelf and completely forgot about it. It's as if the allure of the game lay solely in the fact that I couldn't have it. But that can't be all of it, right? There must have been something really impressive to send me on a decade-long hunt for this game. I suppose now is as good a time to find out as any. I suppose it shouldn't surprise me that Wizards and Warriors has a continuity to the series. 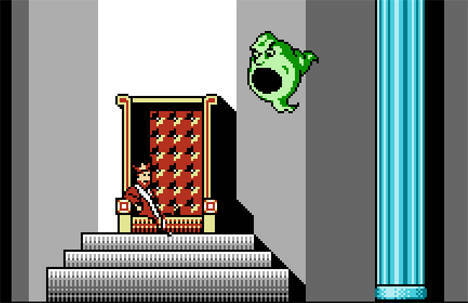 Plenty of games, such as Castlevania, featured this in their sequels by the time these were released. It strikes me as odd nonetheless, because the gameplay was always so wretched up to this point that it seems hard to imagine that the designers would even bother to incorporate a story at all. Not that this is Dostoyevsky or anything. In this third installment, the evil wizard, Malkil, having been defeated at the hands of Kuros, has fled in spirit form to the peaceful city of Piedup and assumed the persona of the local monarch. Kuros, meanwhile, wanders the land for months before, drawn by fate, he too arrives at the new home of his old nemesis. To reach Malkil, he will have to rescue the king's three daughters and enlist their assistance to gain access to the castle's throne room. At first glance, Visions of Power does not seem so different from what came before. 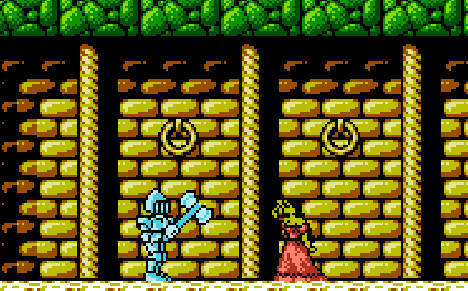 You're still a goofy-looking knight with a useless sword which he holds as if it were his manhood when jumping. You still have to acquire keys to gain access to most doors, which hide assorted treasures and the occasional trap. The biggest change and the one which adds the most to gameplay are the three guilds: Warrior, Thief and Wizard. Hidden in the world are statues representing these guilds that you must collect in order to join. 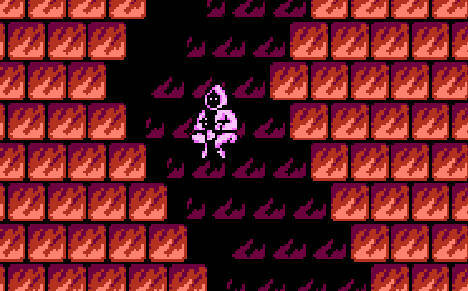 Once returned, Kuros faces a test of skill consisting of a platform area and a mini-boss fight. As you progress throught he three ranks in each guild, these challenges become quite difficult. The reward for joining a guild is gaining access to their uniform and abilities. The warriors gain combat moves and greater weapons. Wizards have offensive and defensive magics at their disposal. Thieves are light on their feet and can enter buildings by dubious means, such as a crowbar that allows access through the windows of some places. You still have to use a key, however, which I would think would be unnecessary if you're holding a crowbar. Another cool aspect of guild membership is that you can pass through the game's three areas (city, castle and dungeon) without being attacked if you are wearing the uniform of the appropriate guild. This means that the amount of fighting action in the game can be almost non-existent, making it more of a platforming game with the occasional boss fight. Under other circumstances, this might be a negative thing and make for a boring experience. But this is Wizards and Warriors and Kuros is still one of the most inept fighters in videogame history. You can use your weapons in five directions and execute attacks by holding the B button and then pressing in the direction you wish to strike. But, until you reach the second level in the Warrior's guild, your range is so abysmally short compared to your foes that your weapon resembles a switchblade more than a sword. Futher adding to combat issues, Kuros feels terribly slow and will almost certainly not respond in time to prevent you from taking damage from an enemy. Everything also takes several hits to kill and, in the case of even the weakest of bosses, can kill you in half as many hits as required to eliminate them. Discretion is not just the better part of valor, it's pretty much the only way to survive this. Once you have managed to prove your worth to the guilds, you are in a position to rescue the three daughters of the deposed King. Each of them has a jewel needed to access a secret path to the throne room of the castle. In order for them to agree to give them to Kuros, he has to agree to marry them. Each of them. I'm not sure what message the developers are trying to convey here, but I can only see it going one of two ways, neither of them positive. The first is that polygamy, a crime in all fifty of the United States, is somehow not an unreasonable thing to participate in. Alernatively, they could be saying that the way to get a woman to do something for you is to lie about loving them*. 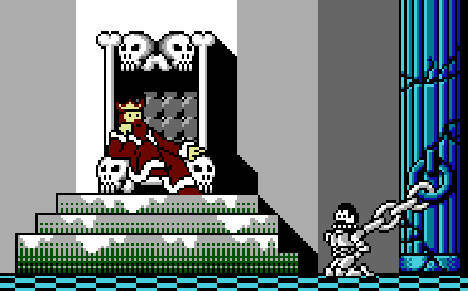 All things being even, Wizards and Warriors III probably was not worth the effort I spent in procuring it. It isn't a bad game, just one that has some great ideas hampered by serious flaws. Certainly the best in the trilogy (and yet, the only one not developed by Rare) and worth giving a play if you can come across a copy. Just don't spend ten years looking. *I won't lie to you, though. One of these lessons served me quite well in my youth.